After a successful 8 hours of advance guard action, I was already deviated from history while playing this scenario. With the bridges at Stavelot and Trois Ponts secured, the advance towards the west looked guaranteed. Such was my optimism that the historical advance route through La Gleize suddenly was not so inviting. The impressive success in securing a crossing as far as Habiemont by 1730 by advance parties from KG Peiper was the final nail in the coffin for following the historical path. Early morning of day two. The German success at Trois Ponts is expanded to Habiemont. During the early hours of day 2, the enemy launched timid attacks on the Habiemont bridgehead, not enough to threaten it, but certainly enough to stop its expansion. At Stavelot, KG Knittel (arrived earlier on day 2) was recalled from its northbound push and ordered to defend the crossing. A rapid dash of the main body of KG Peiper via Trois Ponts towards Habiemont was ordered, but couldn't be executed because enemy troops were blocking the main road between these two locations. It took one day to get the main body of KG Peiper to find an additional crossing. As day two grew older, the enemy pressure on Stavelot, Trois Ponts and Habiemont increased significantly. So big was the enemy pressure at Stavelot, that the newly arrived KG Sandig had to remain there reinforcing the defenses of KG Knittel. By the start of day 3, the main body of KG Peiper has found a crossing south of Habiemont and crossed it in full force. Despite the significant gain in real estate, it was to be stopped by a shortage of fuel for its tanks. Resupplying the main body of KG Peiper took a good 36 hours: the enemy appeared to have been in control of the main roads between Trois Points, Habiemont and the southern crossing mentioned above. Fortunately, a new kampfgruppe (KG Hansen) arrives and starts to revert the fortunes of war at Trois Ponts. It was a hard and slow attack, but the crossing was cleaned up eventually by a two pronged attack that cleared yet another crossing for the German troops. By the end of day 3 is clear that no further significant offensive operations are possible. All three kampfgruppe are either heavily engaged in combat, slowly progressing or in the process of consolidating objectives or just badly mauled and lacking supplies. During day 4, the main body of KG Peiper starts offensive operations in a norther direction against enemy troops assailing the Habiemont bridgehead. Due to the close terrain, the tanks, PzGren. and heavy weapons arrive piecemeal. Losses mount by the hour. 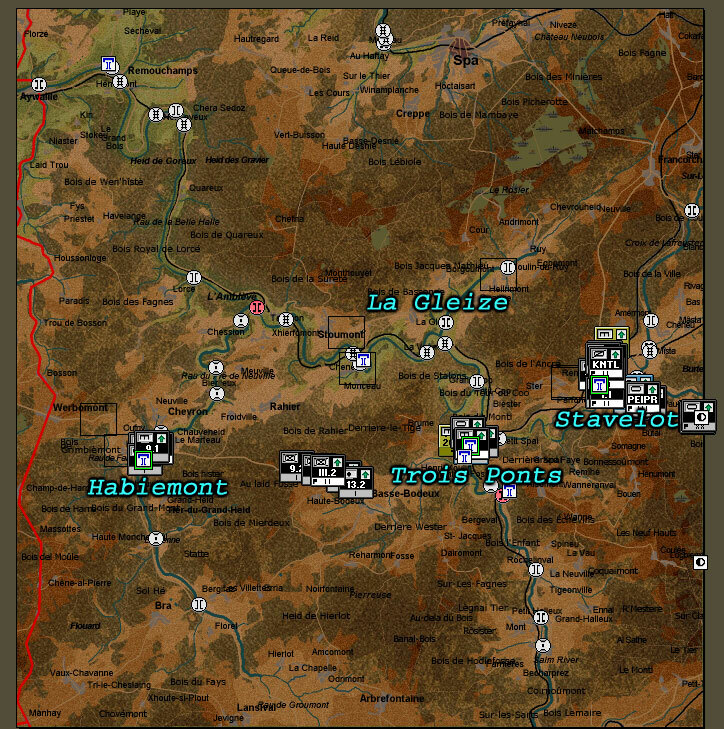 Day 5 and 6 were devoted to consolidating our positions, redeploying artillery gun tubes against the enemy attacking Stavelot and sending out small detachments from Trois Ponts and Habiemont towards the Meuse exit (northwest tip of the scenario's map). 6 days of combat. Yellow arrows and icons are German troops and operations. Red arrows are the enemy's main axis of attack. Dotted yellow arrows are German detachment's routes of infiltration towards the exit point at the top left edge of the map. 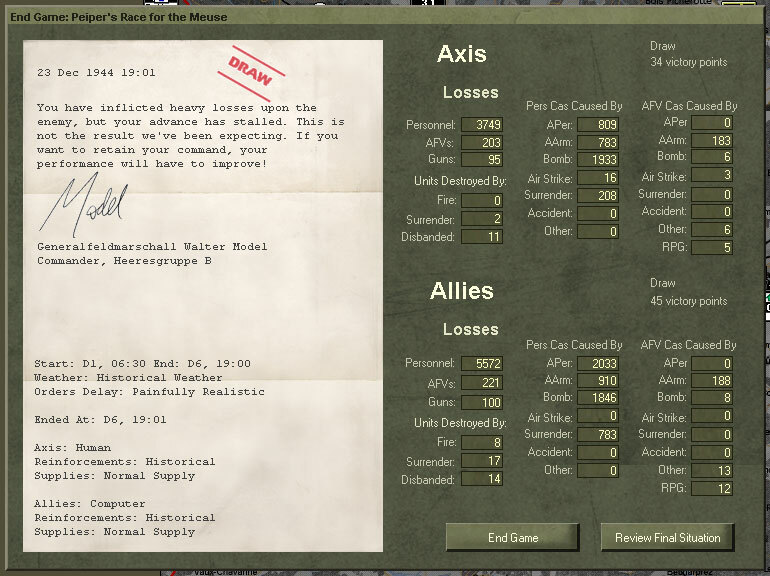 The in-game debrief screen. A bloody battle with no clear winner. 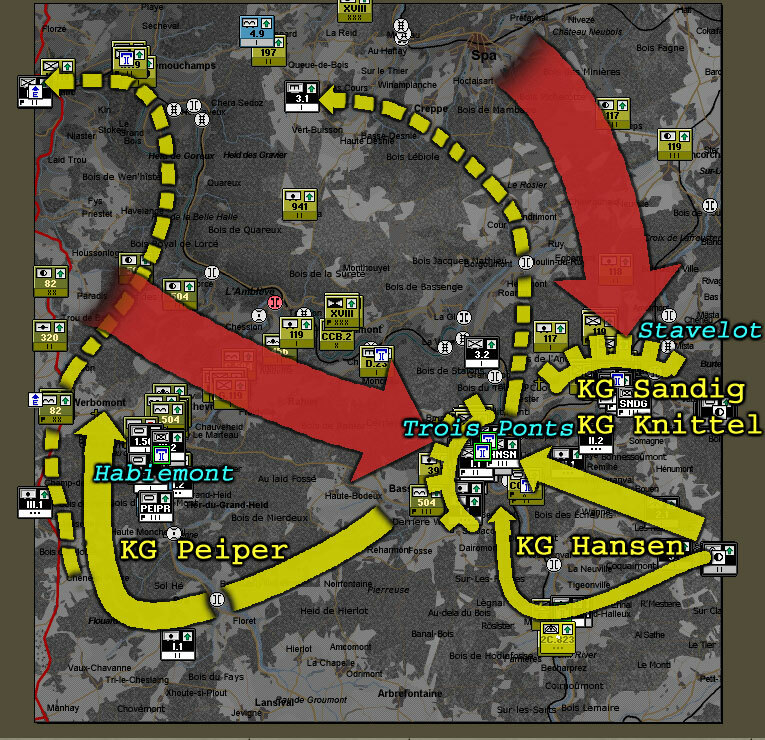 The limit of advance of the German troops in the game scenario, although geographically different from the real life counterpart, is not too different from the military point of view. At the end, we have German troops overextended, under-supplied, with a vulnerable northern flank and unable to push to the Meuse. The fuel supply mishaps I suffered during the game have an uncanny similarity to the real life ones. Rapid and continuous advance needs a strong tip and secure supply lines. An exquisite fine-tuning of the economy of force equation (advance guard vs. troops securing supply lines) is obviously beyond my current abilities. Great gaming moment: KG Peiper just crossed the river south of Habiemont and immediately halted due to lack of fuel. It took 36 hours to get fuel to the tanks of 501st SS Bn. When KG Hansen finally re-opened the supply lines, seeing the fuel inventory of the tanks of the 501st go up in real time a couple of hours later felt like a million dollars! The importance of reconnaissance and strong advance parties can't be ignored. In a game like this, where you can't turn a regiment on a dime, committing a whole task force on a single road in close wooded terrain is a recipe for disaster. In this scenario, I had a whole battalion of Tiger tanks stopped cold by a single company of American engineers within the heavy woods between Trois Ponts and Habiemont. Shame! Kampfgruppes are combined arms teams. I let the advance parties to go beyond artillery support range and the consequences were continuous delays in advance in some parts of the battlefield. Like the Tiger tanks mentioned in the previous point. Continuous contact with the enemy, although it requires diverting resources here and there, it's absolutely needed. In this scenario, the enemy was mostly on foot and able to cross creeks, transverse woods at almost every place. The enemy poured troops between Trois Ponts and Habiemont, undetected and unopposed. Nicely done J. I hope to see many more from this Game vs Book series. A bit rough in the edges, but I am making progress securing free time. More to come, books and games are in good supply! Very well done sir. Love reading this stuff! Thanks for you comments and sorry for the many grammatical errors.